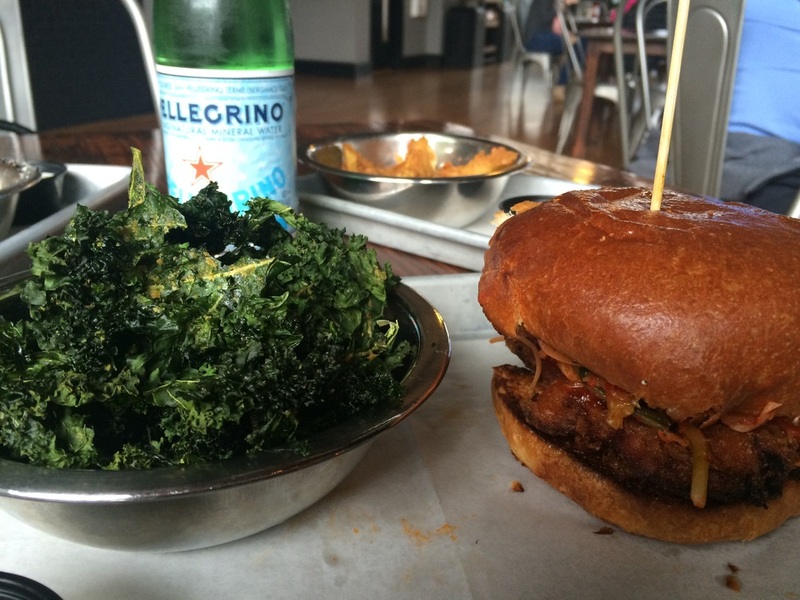 The kale chips and Korean Fried Chicken sammy. Whether a Korean Fried Chicken sammy tickles your fancy or a quinoa salad topped with a basil-yogurt vinaigrette is more your speed, Stationside has a lunch option for every eater. I was invited to try lunch at the King Plow Arts Center restaurant (located in West Midtown Atlanta) last month. (So, yes, y’all, I was hosted — however, opinions are all my own.) Although there are some indulgent tastes including The Caboose burger and pimento mac and cheese, I was impressed that the eat spot prides itself on offering a number of vegetarian/vegan options, as well as gluten-free options for almost every menu item. Stationside is open for lunch Tuesday to Friday from 11 a.m. to 2 p.m. and provides a dinner option for folks who go to see a show at Terminal West. And bonus, parking in the deck is validated with lunch. For my meal, I opted to do a little healthy and a little indulgence and ordered the above-mentioned Korean Fried Chicken sandwich and the kale chips, which are topped with garlic oil and nutritional yeast. Both were total “fits” for my belly. My friend/amazing nail artist, Corinna (ask for her at the Bliss Spa at the W Atlanta Downtown, folks! ), went for the buffalo garlic parmesan wings and the tater tots. So. Yummy. Executive Chef Dan Brown even brought us a sampling of the tempura avocado — and really, how could that be bad? And we couldn't resist trying the chocolate chip cookie whoopie pies. Worth every happy calorie. We left satisfied and eager to return. I’ve already recommended this as a lunch option to coworkers at my day job at Georgia Tech. Bravo, Stationside. Bravo.